The second generation of Misfit’s award winning Shine not only tracks your sleep, but monitors your fitness, calorie intake and can even send you social media notifications. The Shine 2 is a robust activity and sleep tracker that’s likely to turn as many heads as your feet take steps. 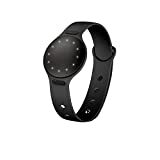 Misfit are known for their pedigree in delivering sophisticated step/activity tracking solutions, and the Shine 2 builds upon the popularity of the original. First and foremost the Shine 2 lacks kind of sensors (there’s no heart rate monitor, or anything to measure noise, light or temperature) – instead an accelerometer and magnetometer sit at its core. As an activity tracker it’s capable of measuring: steps, calories burned, distance, as well as different activity types. When it comes to sleep the Shine 2 logs sleep quality and duration, it differentiates between light and deep sleep periods, there’s even an alarm function that should jolt you from slumber using vibrations – but these are only light and won’t wake deep sleepers. Suffice to say you’ll be hard-pressed if you’re looking for a device that offers a bit more muscle in the sleep department. Like its predecessor the Shine 2 is perhaps best likened to a shiny space-age pebble – however this time around it’s both bigger and flatter in appearance. It’s been crafted from aircraft-grade aluminium and glass-reinforced polycarbonate meaning despite its 8mm stature it’s still hard as nails. The series of 12 LED lights that decorate the face are now multi-coloured and flash in different hues in accordance with corresponding notification triggers. Owing to the design of the silicone strap and clip, the Shine 2 is prone to falling off – so you may have to keep an extra-beady eye on it if you don’t want to risk losing the thing. A nice touch is the addition of a clasp that enables the wearer to affix the device to their shoe, shirt or belt (cyclists may find greater accuracy when attached to the shoe for instance). The clasp may also signal a solution for those looking for a more discrete activity tracker. Like the original you can dive to a depth of 50 metres without worrying about damage. The Shine 2 is available in either black or rose gold. The Misfit App is available for iOS 7 (& above) and Android handsets running 4.3 Jelly Bean. The app does a good job of logging your daily activity level in steps (or points). It also allows you to specify activities (from a group of 9). You can also pair the device up to IFTTT (a web service that makes it possible to create connections between the things you own) or via the dedicated “Link” app so you can use your Shine to turn on things within your smart home if you’re into that. Despite the shortfalls of Shine 2’s sleep-smarts you can get more from your data by syncing it to a variety of third-party apps. If for example you hook it up to Evernote, you’ll be able to annotate your sleep data and form a sleep journal of sorts. A nice touch. Unlike its contemporaries on the market, the Shine 2 doesn’t require charging. Instead it gets its juice from a replaceable coin cell battery – which itself lasts up to six months. The Misfit Shine 2 is available now from various online outlets – you’ll find it for around the $99.99 mark.